Blue Dragon is part of the Japanese RPG genre and is similar in design to the Final Fantasy series partly due to Hironobu Sakaguchi overseeing production of the game and writing the story. 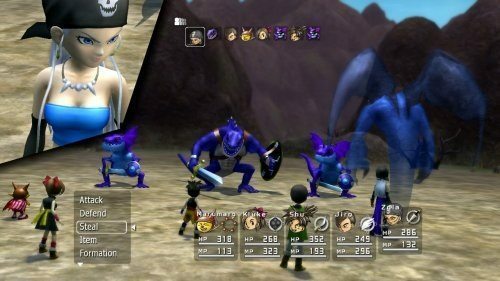 In Blue Dragon you’ll get to explore a great open world as a group of five friends who take it upon themselves to deal with the increasing threat of Nene who rules over the Grand Kingdom. The story and its accompanying setting was so highly rated that it led to the introduction of an anime and manga spin off adaption. The game starts as a mysterious purple cloud appears over the Talta village where the player and his friends call home. This purple cloud has surfaced many times before and only brings death and destruction leaving the village inhabitants to take shelter. 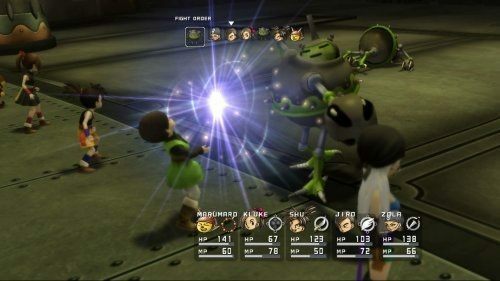 The player and his friends get caught in the storm where they discover the truth behind it and unlock a power within them which lets players summon a shadow capable of protecting them and defeating foes. Gameplay involves a very old fashioned approach to the Japanese role playing genre with a turn based combat system that has plenty of strategy decisions to be made to ensure success. The game is split between the town filled over world and various dungeons that players explore and must rid of evil. Unlike older games that use a random encounter system you can avoid the majority of battles in Blue Dragon if you wish but main battles are unavoidable with enemies often blocking access to an area. Once a battle is initiated by running into an enemy (bonus benefits for attacking from behind) the player enters the battle screen which fans of other turn based games will instantly recognise. Strategy in battles involves the usual careful selection of targets, when to use your skills and how long to charge up spells for, one of the more unique features of Blue Dragon. Blue Dragon strikes a great balance between player freedom and linear story and all of the gameplay is solid enough to enjoy it just doesn’t do anything outside of the Japanese role playing game box. A turn based tactical game with plenty in common to Final Fantasy. Control five friends on their journey to beat evil. Take control of your shadow power while gaining levels and new skills. Lack of random encounters lets you avoid fights with ease. Plenty of depth in the combat system.